Wavepad 5.08 Portable » TopFreeSoft.Net - Best Freeware Software! 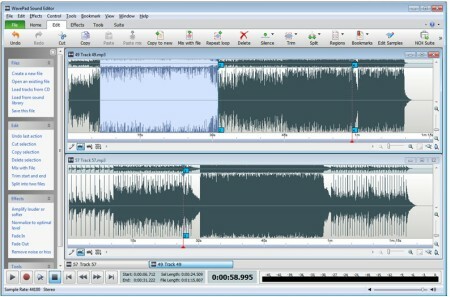 Professional sound editing software for PC. This audio editing software is a full-featured professional audio and music editor for Windows and Mac. It lets you record and edit music, voice and other audio recordings. When editing audio files, you can cut, copy and paste parts of recordings, and then add effects like echo, amplification and noise reduction. WavePad works as a wav or mp3 editor, but it also supports a number of other file formats including vox, gsm, wma, real audio, au, aif, flac, ogg, and more. WavePad is designed to be a very easy and intuitive-to-use audio editing package. Within minutes, you will be able to open or record a file and edit it. If you take time to explore the other features, you will find many powerful tools designed with the professional sound engineer in mind.